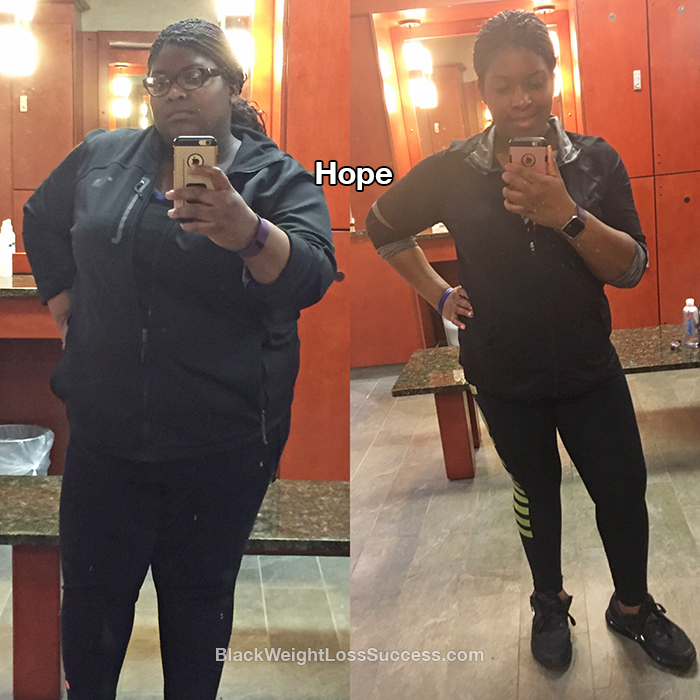 Transformation of the Day: Hope lost 134 pounds. At 26 years old, she was suffering with chronic back pain, shortness of breath and pre-diabetes. She knew that she truly wanted to be healthy and happy as she moved on to major life milestones, like getting married or having children. Check out how she took action to change her life. My lowest point was when I realized that I was approaching 26 years old and was suffering from chronic lower back pain and shortness of breath due to my obesity. It was painful to walk down the block or stand for a few minutes at a time. I barely had enough energy to do anything. I was also pre-diabetic and was told by a doctor that I would be fully diabetic before I turned 30 years old if I didn’t do something as soon as possible. I asked myself, “Is this how I’m going to live for the rest of my life?” The answer to that question scared me to death and that was when I decided to take my health seriously and start this journey. My motivation was constantly reminding myself that I had to do this to get my life back. I still have my future ahead of me, including getting married, having kids and living a long life. I wanted to make the most of it. That is what pushed me everyday to maintain my healthy eating habits and consistently exercise. My eating routine consisted of protein meal replacement bars and shakes, along with other low calorie fluids throughout the day. I ate one or two low calorie, high protein, low fat meals per day. I stopped eating fast food, eating concentrated sweets, drinking soda and eating unhealthy carbohydrates. I eat healthy carbs sparingly, 1-2 times per week. I also eat every 2-3 hours to support my metabolism. My workout routines are mostly cardio. I do 1-2 hours on the elliptical. I am now starting to incorporate weight training and strength training into my routine to start firming up and toning. I work out 3-5 times a week. My starting weight was 342.8 pounds. My current weight is 208.4 pounds. I am 5 feet, 5 inches tall. I started my journey on December 21, 2015. My transformation took a year and two months, but it’s currently still going on. I have another 40-50 pounds to lose. My advice to others is to make a decision today to change your life. I spent years putting off my health. I was telling myself that I was still young and still had time to get my weight under control. However, as the years went by I slipped further and further into the hole I was digging myself into. Make the decision today to dig yourself out of the hole. Take the time to write out your goals, put a date to that list and put it up in your room so you are constantly are reminded of what you want to accomplish. Create healthy, daily habits and be consistent and persistent with those habits. Positive habits performed persistently and consistently over a period of time leads to compounded positive results.